Some of my favourites from the system, though, are also widely considered some of its worst examples. 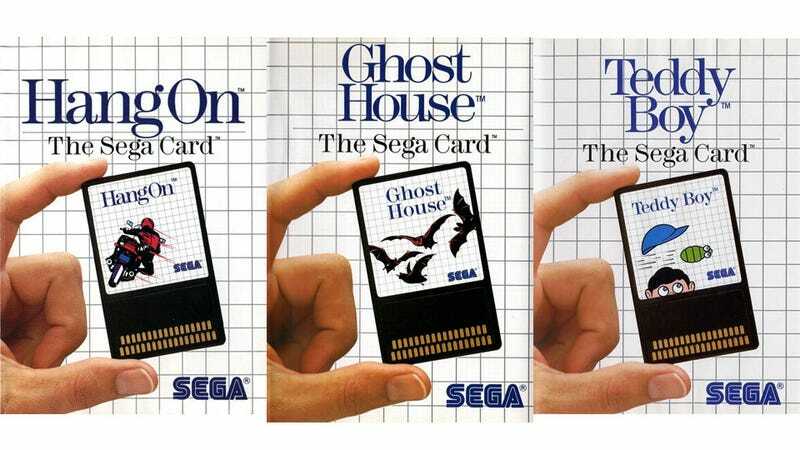 The 1986 horror game Ghost House should have been notable for the fact it was one of the few titles released on Sega's ill-fated Sega Card format, but it's remembered more for its box art. Ditto for Teddy Boy, My Hero, Super Tennis or any other game released on the short-lived medium. Isn't it amazing? The nerve of them. I don't know if it even qualifies as box art, since there's no box art to speak of. Just a shot of the card art, the standard Master System template and some text. As a lover of fine box art, I should hate this, but...I love it. It's so brazen. I like to think the over-worked developers of these games all got together around 1986 and just sighed, cigarettes in hand, took a few photos of their carts, slapped some text on them, sent them to the printers and hoped nobody in management noticed. The Sega Card was a neat little format used on both Master System consoles and Sega's older SG-1000 machine, a console so awesome I'm going to have to write all about it tomorrow.